Database of occurrence records compiled for Sargassum muticum. Aim: Phenology of a wide diversity of organisms has a dependency on climate, usually with reproductive periods beginning earlier in the year and lasting longer at lower latitudes. Temperature and day length are known environmental drivers of the reproductive timing of many species. Hence, reproductive phenology is sensitive to warming and is important to be considered for reliable predictions of species distributions. This is particularly relevant for rapidly spreading non-indigenous species (NIS). 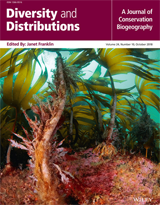 In this study, we forecast the future ranges of a NIS, the seaweed Sargassum muticum, including its reproductive phenology. Location: Coastal areas of the Northern Hemisphere (Pacific and Atlantic oceans). Methods: We used ecological niche modelling to predict the distribution of S. muticum under two scenarios forecasting limited (RCP 2.6) and severe (RCP 8.5) future climate changes. We then refined our predictions with a hybrid model using sea surface temperature constraints on reproductive phenology. Results: Under the most severe climate change scenario, we predicted northward expansions which may have significant ecological consequences for subarctic coastal ecosystems. However, in lower latitudes, habitats currently occupied by S. muticum will no longer be suitable, creating opportunities for substantial community changes. The temperature constraints imposed by the reproductive window were shown to restrict the modelled future species expansion strongly. Under the RCP 8.5 scenario, the total range area was expected to increase by 61.75 % by 2100, but only by 1.63 % when the reproductive temperature window was considered. Main conclusions: Altogether these results exemplify the need to integrate phenology better to improve the prediction of future distributional shifts at local and regional scales.